There are three types of marlin that we consistently catch in Hawaii, Pacific Blue Marlin, Striped Marlin, and Pacific Short-nosed Spearfish. Pacific Blue Marlin, otherwise known as the the “ultimate gladiator fish of the sea” possesses its own skill and cunning so when you book your Muai fishing charter it is of great importance that you have a skilled captain with the experience and knowledge to go up against this beast of the deep! Sport fishing in Hawaii is the ultimate in fishing and landing a blue Marlin is the ultimate tests in fishing. Pacific Blue Marlin range in size from 100-1000+ pounds, in fact, the largest Blue Marlin caught in the world was caught in Hawaii weighing in at 1805 pounds! Striped Marlin are known for their acrobatic schooling. 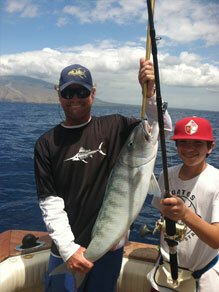 Winter in Hawaii is prime time to catch this relatively small fish ranging from 25-125 pounds. When matched with the appropriate gear, Striped Marlin are a blast to catch! You can literally have every lure in the water get bit as they attack the patter. Pacific short-nosed Spearfish is uncommon everywhere in the world, but in the waters of Hawaii it is one of the few places these aggressive and diminutive Marlin can be caught. Pacific Short-nosed Spearfish are caught trolling and live baiting, but can also be caught with light tackle and fly gear. Short-nosed Spearfish range in size from 20-60 pounds and can be caught all year round. Other Hawaiian gamefish are Mahi-Mahi, Ono (Wahoo) and Ahi (Yellow Tail). Mahi-Mahi means strong in Hawaiian, which rings very true for the most pentiful game fish in the ocean. When hooked, Mahi-Mahi put on a spectacular aerial show and the distinctions between males and females can be seen by looking at the shape of the head. From golden to green to aqua to silvery blue, the Mahi-Mahi displays incredibly vivid and beautiful colors! Ranging in size from 12-70 pounds, Mahi-Mahi can be caught year round in the beautiful waters of Hawaii. Capable of approaching speeds up to 50 miles and hour, the Ono is an aggressive predator that attacks lures and bait with equally wild abandon. We've seen them leap 12 feet out of the water attacking rigged baits! The Ono boasts razor sharp teeth perfectly designed for slashing which are positioned on jaws that work like scissors. Ono means “delicious” in Hawaiian, and they are regularly served in the many seafood restaurants on the island. Ono range in size from 15-60 pounds and are semi-seasonal in that we see the majority of the fish in spring, summer, and fall. While you can expect to catch four to five seperate species of tuna off Maui, the one that consistently gets bigger than 30+ pounds is the Yellofin Tuna or Ahi. In Hawaiian, Ahi means fire, this is in reference to back in the olden timed when fishing from outrigger canoes the line would go out so fast over the side, it would smoke the sides of the canoe! Like all Hawaii game fish, Ahi can be caught all year round, but spring and summer are generally the best time to catch some Ahi!